“One of the many goals of the Artist-in-Residence program at the de Young Museum is to explore connections between the artists and the surrounding park environment. These connections enrich our museum visitors’ experience through the guest artists’ explorations and interpretations. Visiting artists from around the globe offer a unique experience to learn about natural materials found right here in Golden Gate Park. Māori artist Glenda Hape uses flax to weave and create contemporary art. There are more than 7,500 exotic plant species surrounding the de Young in Golden Gate Park, including several types of ornamental flax. The species of flax Glenda needed to continue her weaving projects in the Kimball Gallery is called Phormium tenax, also known as New Zealand flax (or harakeke in the Māori language). Last week, Glenda explained how difficult it is to harvest the materials she uses in her artistic practice, but with the assistance of Andy Stone, gardner and park supervisor for the San Francisco Recreation and Parks, Glenda’s harvesting trip around Stowe Lake was bountiful and she found just the right flax (harakeke). Māori only harvest the outer, older “ancestor” leaves, which represent grandparents. They preserve the younger, overlapping inner three leaves, which look like a “V.” This configuration represents the family, the newest shoot is the child flanked and protected by the mother and father. Harvesting in this way also helps the flax bush to continue to grow. 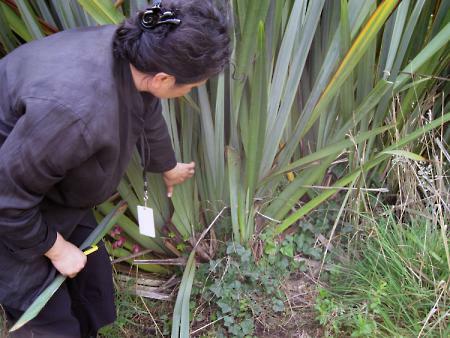 via Artist-in-Residence Glenda Joyce Hape Harvests Flax in Golden Gate Park | de Young Museum. This entry was posted in arts, de young museum, people, plants and tagged art in golden gate park, golden gate park, Maori art. Bookmark the permalink.